NOTE#1. Looking for transparent compressor? This not your choise. This compressor adds a lot of coloring to sound. Fixed working with VstToRTAS adapter. Changed limiter code (based on Limiter №6). VU-meter calibrated for -18 dBFS, 300 ms.
uses high sample rates (the value goes proportionally smaller). Attack/release curves were reverted back to 0.2.155 version. old binary with this version. Difference between frequency responses in different oversampling settings was minimized. New Plugin-ID value. Now you simultaneously use this version and previous version of plugin (copy under different names). Release curve was slightly changed (a bit shorter at small signal values). Frequency response in oversampled modes changed to be more linear. When user-adjustable sidechain filter is off now built-in lowshelf sidechain filter applied. Some presets have oversampling off by default. Latency was fixed to be 3 samples (was declared as 2 samples by mistake). Fixed race conditions with some hosts. WavoSaur, Sonar. Fixed phase shift between M and S channels. Added new mode “R-S.chn” (get sidechain signal from R). Vitaly Zolotarev for valuable ideas. Thank you for wonderful compressor! How about implementing another input channel for external sidechaining? Also, how ecatly are M and S treated in M/S mode? What’s the use of it when there’s just one set of parameters to adjust for both? Whoops, sorry, I see it now. Yeah, you can remove M and S, I think. You should quit making stuff for free, your work is worth money, please stop and start sell! Thanks for this- very nice. I’m getting real jumpy mouse movements using Sonar X1/ PC x64 though. I love your compressor too! One thing baffles me though – what does the sigma/alpha switch do? In addition to the Dry/Wet control, a simple Bypass switch would be nice, too. And there’s a place for this switch right to the “dry mix” knob. Hmm, I’ll think about it. Thx for this good Plugin tested it shorty, but sounds really good. One thing i found everytime when i load a preset another preset gets away. For example if you change preset X and load preset Y preset X looses all changes. Did I understand clearly? sorry the first time i wrote here it was very short and not clear what i wanna say sorry. now i try to say it better with my bad english. everytime i change X and load preset Y i don´t see the X preset name in the list. it still works but i don´t see the preset name in the list. and if i load 5 presets then i have 5 empty presets in my list the still work all but the names are gone and there stands nothing. i hope u unsterstand what i would say. thx. Okay. What is your VST host? Cubase, Reaper, Fruity Loops? I’ll try to reproduce it and fix. Okay, I’ll check this soon. thx, but the other things work very well. thx again for that great plugin. I am impressed, really impressed. Your GUI is amazing… I have always loved the ruggedness of Russian military hardware, and the photo realism of the VU and chickenhead controls is so cool. Sound wise, I gave it a wind for a good few hours last night, against my other buss favourite – a UAD Neve 33609…and I was very surprised. I wouldn’t call it uber subtle, but it colours the sound in a way I really enjoy and in many instances, I thought I got it to sound at least as good as the 33609, and in some instances beguilingly close to an 1176 thwack. May this be the first of many (Russian military?!) themed plug-ins. Sincere thanks and congratulations from sunny Cape Town, South Africa. Yo, te pasaste, This compressor is owesome bro, I did compare it with other compressors and yours is more than professional. Thanks a lot. I agree with all the positive comments regarding Molot; it sounds (to me) as good as it looks and seems to have no aliasing or other interface problems. I find it hard to believe Molot is this developer’s first plugin offer! As good as any of the UAD plugins I have, but without the latency issues. As a UAD Fairchild owner and Density MKII user, i have to say that Molot is realy well up with these upper class Plugins. And yes, in sigma-mode Molot realy has this special kind of snap and transient accentuation that i heard from Neve 33609 buss compressor. In Alpha-mode its very close to UAD Fairchild. But it would be perfect to have an Input Control on it, because some signals (especialy self recorded ones) are not loud enough to pass the threshold in the intended way. I know its hard to find an empty place for it on the GUI, so maybe you can create a smaller knob for the sidechain filter and put it above the meter and put in the Input Control instead. But as an initial release Molot still is surprisinlgy good. Its the new best free Fairchild emulation !!! Thank you so much ! What about the english terms for “hard” and “Soft” knee and “mid” and “Side” ??? Will they be translated in future ? Wow, one of the best sounding Compressors for free! Good work! 100% my Taste…. Great work! Very cool sounding (and looking) plug. Sounded great on a whole bunch of things – very unique sound. What is the difference between alpha and sigma, BTW? I agree with Bob on the input. This is just my opinion, but I would lose the midscoop altogether, and replace it with the input (I suppose you would want to shuffle the layout around at this point). I say this because while the midscoop is a good idea, I would look to a dedicated EQ to do this for me. Separate EQ also provides me more control of freq, Q, gain, etc. I like compressors to compress, and EQ’s to EQ (unless its a good-sounding channel strip design). But again, amazing work on a great-sounding plug! Looking forward to more of your designs, Vladislav. No, sorry, Please dont touch the Mid Scoop EQ ! Its magic and uncomparable to any other EQ ! It realy solve Guitar frequency problems and pushes snares ! THE SCOOP EQ MUST REMAIN ! 😉 Make the Sidechain Filter, the Knee, the Dry Mix and the Oversampling a bit smaller, and there will be enough place for the Input ! A bit more variety among the knobs will make the GUI more interesting anyway. O.k., what about this compromise? : He can take the Mid Scoop knob out, if he brings out an extra parametric EQ-plugin on the basic of the mid-scoop algorithms. I think thats the best way ! Very clearly laid and easy to read out controls – looking forward to trying this plugin. Excellent! Thank you for raising the bar on free VST`s! I was testing Molot last night. It sounds very good to me. Maybe I noticed a CPU hungry in the 4X and 8X modes. Why does this happen? For example if your project has 44.1 kHz sample rate with 4x oversampling the plugin increases internal sample rate up to 176.4 kHz and has 4 times more data to process. U are great DSP programmer and your plugin too. I think better than other famous plugins! Can I have a question? Do you have any other plugin? Like a EQ or Saturator or Limiter etc…? I hope so will be! Great great sounding compressor!! thanks thanks Vladgsound!! however hope you don’t offend if i say to you the integrated limiter is miles away from the quality of the compressor, clearly inferior distorts pretty easily; this is even more strange because it’s a soft limiter…it doesn’t stop the peaks (and this is normal for a soft limiter, i know) but at the same time distorts like an hard clipper: as is, it takes the worst of both worlds. A soft limiter is useful only if it sounds so “warm” and natural that you can forgive it the inability to catch fast transients. Hope you’ll surprise us soon with an awesome updated soft limiter. This is the thing that should be enhanced! this is really one of the best software compressors I have ever used – and I own quiet a lot of different commercial ones. In my opinion it is better than every single compressor offered by a big (and expensive) company from Israel. Quickly molog has become my go-to-compressor for drums & bass. It is clean enough to be used on busses and still has a very great and unique character. Thanks a lot for your work! Go on! I am looking forward to further developments of molog and hope to see more plugins from you! There are very few very outstanding freeware developers for vst-plugs: bootsy, pylorca and now: YOU! I’m still having a great time with Molot! When I get a moment I will upload the results of Molot vs UAD Neve 33609 so we can all hear just how close you can get with some judicius tweaking. In the meantime, to satisfy the desires of those who can’t wait for an input gain stage, I have been putting phoenixinflightaudio’s Thriller v1.3 eq (with gain stage and limiter) to great use as a front end for Molot…and yes, here’s how to get Simon Phillips’ drum sound out of EZ Drummer (Try it on the 85 bpm shuffle demo…) Yeah, freebies are really getting good these days. Inspiring stuff. Three weeks of tweaking later, and I am even more impressed than the day I first heard Molot. I love this compressor! Now, whose drum sound shall I nail today? Thanks and Greetings from Italy! I have a UAD-1 with Fairchild, 1176, LA2A next to some others plugins. And i intensively tried the Neve Comp over the entire full working demo-mode period and even could activate this demo a second time if i want. But there is no reason, neither to try it nor to buy it. Of course its not 100% the same, but Molot definitely plays in the same league. The main advantage of the Neve BusComp Sound is, that it keeps transients in a way normaly known from feedback-compressors like Marquis or API, but without any shaping. It gives the signal a kind of subtle but in itself agressive attack with all the original punch and highs. The SSL-BusComp e.g. is more a peak tamer ,thats why its also a good Master-Bus Compressor, while the Neve is better used on track-buses. Molots sigma mode is for people, who can not have enough from the Neve 33609 character. Here you realy should care about attack times, knee softness and the limiter, not to get OverNeved ! 😉 Since Molot, i cant stop to think about the money i could get for my UAD on ebay. Thanks a lot! Yes it sounds great on drums! Unfortunatelly it’s very weak on vocals and inappropriate as mastering one. In a mix I’m doing at the moment, it works great on the (female) lead vocal. I actually prefered Molot over Softube CL1b, a plugin many people believe is one of the best vocal compressor plugins out there. Greetings from Holland! It sounds so bruitiful. Thanks a lot. I hate to say it but this is everything my uad fairchild is and 4x more and I can’t stop using it, also I have recommended it to others and will keep doing it, thanks bro! hey vlad absolutely awesome compressor ! thanks for your talent, time, generosity and talent . what can we expect from you now ? an eq ? other comp ? saturation ? Thanks a lot! I’m working on ideas for the new plugin now. Link is to song on my SOUNDCLICK page. I usually use 2 instances of Molot on main vocal (preset vocal (ins.1) and then preset vocal (ins.2)). I think 1 instance doesn’t fit vocal to sit in mix well. I’ll try to check it soon. Hi! I tried to reproduce this but it works fine for me. I used demo of Ableton live 8. I think the problem is not in DAW. Some people response me they have problems with different DAWs but when I tried to reproduce it worked fine for me. I think maybe problem is in versions of some libraries used by plugin. I have idea to recompile plugin with static libraries and maybe this can solve this problem. As soon as I’ll have free time I’ll try to recompile plugin and I’ll mail you. Hey man, great plugin I love it. I have a feature suggestion. An option to upsample 8x when rendering would be great. About this feature I have a problem. Current version of Molot sounds a bit different in different oversampling modes (different frequency responses) so it could be very annoying when your project sounds the other way after render. I think I should fix this first and only then add max oversampling on render option. That is very fair to say, and if you can fix it thats great! It only adds more to whats already an awesome piece of software. You are right, it is annoying, for instance when rendering out of FL Studio, my tracks sound noticeably different and often I have to make mix adjustments after. The problem with that is when making adjustments, it sounds different again! Vladg, I just used the Molot compressor for the first time on a mix. This thing is incredible and had EXACTLY the sound I was looking for. Wonderful. And this is coming from a guy with a couple #1 records under his belt. Good job. P.S., as you update this plugin, if you make any changes that affect the sound (in other words, anything other than a “bug fix”), please give it a separate identifier (or whatever it’s called) so that we can install it in ADDITION to the previous version (as opposed to replacing it). That way us pros won’t have any suprises if a client asks for a recall six months down the road and all of a sudden the plugin sounds different. Hi Chris! Nice to hear you like it! THANK YOU …keep doing what u do …kind regards, Adrian. Nice compressor man! cant believe its free, nice and tight on drums sounds amazing. – What is the idea behind sigma/alpha knob? – Is the scoop eq just a fixed eq, or is it connected with the compressor in any way? – Saturation: Is it fixed or dynamic? – Dithering low/high: What’s the difference? – Filter: Is it for the sidechain only? – Technically this knob affects attack curve: sigmoid or exponential. People say sigma mode sounds like Neve 33609 compressor. Sigma mode has slow attack start and allow initial transient pass through. For drums it has cool hammering effect. Also sigma mode has less digital artifacts and has cleaner sound. In general sigma mode allows the compressor not to reduce dymanic range but work more like transient shaper. Alpha mode works like a lot of compressors do. – EQ is independed from compressor but if you use “dry mix” it affects compressed and clean signals with different curves. – Technically high dithering is 20 bit and low dithering is 24 bit. High dithering adds “air” to sound and feel of analog gear. I like it but in some cases this is not desirable. – Filter is for sidechain only. It sounds great!! There is an issue whereby one can’t move the controls if you wrap the Mac VST to RTAS using FXpansion’s wrapper. The GUI parameters are unresponsive. To see a change you have to close the GUI and reopen it. Please could you kindly take a look and try to fix it. Thanks. A question is only in mono that plug-in…? Hi! Really love this plugin! Just a thought on the attack/release – I was thinking it would be nice to get finer control when setting the values.. like allowing typing in an exact value? I have plans to add numeric values output in next release. Hi! Really love this plugin..
Just a thought on the controls. I’d like to be able to get finer control when setting values. May be something like holding shift and a numeric overlay showing the exact value you are setting? > May be something like holding shift and a numeric overlay showing the exact value you are setting? Good idea. I’ll think about it. thx for this great compressor!! Keep up the good work! I got new ver 0.3 MAC OS ver & I check file version with info. Is this real update version? Oops! I didn’t fix version number in package. It is new version though. It should output “0.3” in the top left corner of VST plugin window. I’ll fix it today. And my tiny request is exactly about attack. You see, I’ve been experimenting with studiounits (a vst to host others and combine them) building a 4-band compressor with molot on each band. (Have to say, if you need extra punchy drums for example, it’s great. You can also go crazy with the attacks so that it sounds totally different, but cool! 🙂 ). This tiny problem I encountered is that you have labeled both the “alpha/sigma” switch and “attack” knob as attack. Studiounits doesn’t understand that and for some reason can only control the “alpha/sigma” switch. I know this request is a bit special but could you label thees parameters so that they had different names? Also, Cubase understood it, but I’m not sure of other hosts. And even in Cubase if you wanted to automate one of the two parameters, you do have a weird moment when you see that there are two attacks in the list of parameters. Thanks to mention it! Now “attack mode” and “attack” parameters have different names. I fixed Windows versions (32 & 64 bit, 4-channel, 2-channel and “no gui”). I’ll fix Mac version soon. You can find the latest version under the same download links. For some reason Molot is not recognised by Reaper (4.22) on a Macbook OS X (10.5.8). Your other plugin, Limiter6, is not recognised neighter. I tried it in a 32bit and a 64bit version of Reaper. I copied the vsts to the proper locations and did a ‘clear cache and rescan’ in Reaper. It just won’t show up. Any advise is welcome as I would love to try these plugin out! I’ll try to get Mac OSX 10.5 somewhere and try to reproduce it. If it’s ok for Limiter №6 I’ll update Molot too. Thank you for your hard work! After using Limiter6 I thought if it would it be possible/easy to implement longer release times in Molot. Maybe in the inside menu as an option? It would be great to see a simple gui for molot lite with a “listen” button for the sidechain too. just a small suggestion, a gui n2 like the one for limiter6, i think molot would work ok with more flat knobs. thanks. Your molot plug in is unbelievably good, it matches the comparaison with the Fairchild plug in from UAD with a more flexible attack and release time. Well done! Thanks a lot for the information! I’m preparing new version of Molot compressor and I’ll try to check it with some MIDI surface. Maybe it can shed a light on your problem. By the way, can you check this with GUI-less version of Molot? You can find it on downloads page. Now it’s fully functionnal so far. FL Studio Patcher (effects chain plugin) doesn’t recognize it and can’t be used in it… anybody knows what causes this particular error? I’d love to have it in my effects chain! Absolutely magic compressor!! More than professional. Keep up the great work on Molot! Thank you so much for providing a GUIless version, too, Vlad. It’s very much appreciated. Some of us like to listen to the sound while we tweak the compressor or limiter, instead of looking at nice, colourful pictures. 😉 I would actually like to encourage more developers to provide us with “bare” plugins like that. You’re the only one that made that wonderful gesture, as far as I know. I mean, how hard could it be to compile a plugin without the GUI? 😉 Thank you! Thanks! Most of the people like attractive GUIs but it really doesn’t change the sound! Also, if you’re not tired, it’s better to adjust settings by ear but not by watching indicators. So your point of view is very respectful! When I develop plugins I try always use my ears to make decisions (and often close my eyes during that), so development versions are always GUI-less. And GUI-less version is just development version. No problems to build such one! I have been testing the Molot compressor for about a year. Thrilled to see the version with a GUI now, as my only issue with it was the lack of metering, particularly gain reduction. It has become a go-to compressor for me for buss compression, particularly on drums and guitars, but works well on just about every source I’ve tried. It may not always be the color I want, but when it is, it is fabulous! Thanks! And by the way, just discovered the Limiter No. 6 plugin as well. In preliminary tests I really am enjoying it as well! I’m very glad you enjoy it for a year even without GUI! Thanks! Thank You very much for Molot plugin! I’m waiting for my custom made (by my friend, sound engineer/electronic) studio monitors (highest model, worth about 3000 US dollars) = very detailed sound. When it comes, will write You how Molot is working on it:) BTW I use it now on my old speakers and headphones and Molot is brilliant!!! Thanks a lot for this great plugins. Keep it up. Thank you very much for this plugin, you can port it to lv2 or lxvst (linux vst) the code is open? I work with Linux but have a vst not easy nor productive, lots of people I’d appreciate it, thanks! It’s stripped open-source version of Molot. Also you can contact this guy: Caleb Reach (jtxx000 AT gmail.com) and ask him about his progress of LV2 port. Thanks!!! I’ll keep you up to date on the LV2 port’s progress. Wow! is more than I expected, thank you very much, I will try it now! Does that zip file contain Linux vst’s that I can use in Ardour3? Regards. No, I don’t have Linux port. You can contact these guys: Caleb Reach (jtxx000 AT gmail.com) and Xarxastudis (catorze14 AT gmail.com) and ask them about their Linux port of Molot Lite. Thank you for releasing code so linux users can use this great comp. Just curious, why only release code on a stripped down version? > why only release code on a stripped down version? Molot is a very awesome Plugin. Thank you for your good work! Is it possibel to do a “Mastering” Version with two Molots side by side in one Plugin. One side for Right/Mid signal and the other Side for Left/Side signal with Link button and solo listening buttons for both sides. I know the plugin can be opend two times and switched on one to Mid and the other to Side, but I think a separate “Mastering” Version would be easier to use. fantastic compressor! thank you for sharing this monster! cheers from cologne and respex! Does Molot detect input signal level looking at peak, or RMS, or something else? – Thank you for creating these plugins! Molot has averaging detector. Technically, it’s smoothed peaking detector. Thank you too! Dose the Molot use a feedforward or feedback circuit design? I’m just curious. Awesome compressor and great work Vlad! This is a REALLY good compressor–thank you very much. I’d gladly pay you for it. Do you have a charity you’d like me to donate to? 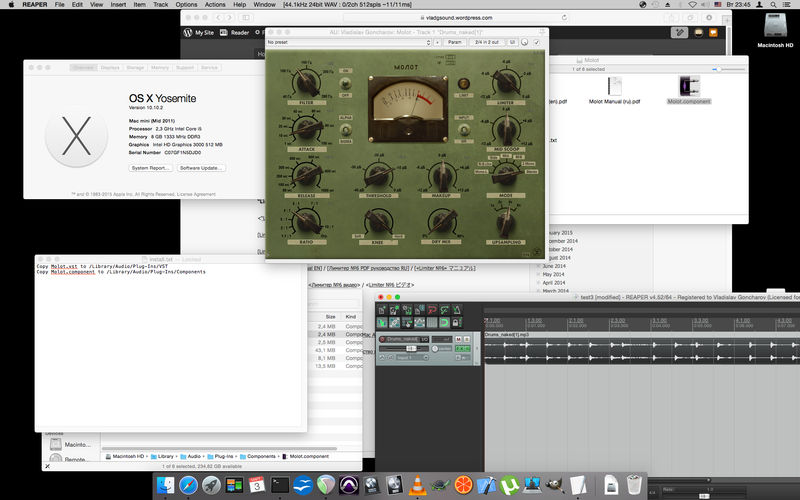 A dumb question though–using LogicX , Molot will only be available on the out buss. If I want to use it on an individual track, say foir example a bass track, I have to load it on the out buss, then drag it to the track I want to compress. Is this normal behavior? Can I change this? Found this compressor about a month ago and I’ve thoroughly enjoyed using it. The only possibly suggestion I have would be to have some way of setting different parameters in M/S (akin to a Fairchild). Maybe an extra switch to choose between input channels? In the meantime I’ve been using two instances, but that is very processing taxing and is only really feasible once stems have been printed or the final 2TRK. Favorite part has been the chickenbeak knobs a la old Fender Tweed series amps. Hi vlad I mentioned this a while back… the limiter on the mac vst version doesn’t work flawlessly!!! – there is no difference between the pre and post settings. No matter how much I crank the Makeup the light and sound do not alter as i switch between pre and post. On the earlier version 0.2.168 the pre and post do work as expected. Hope this helps, and hope you can fix it for us. Thanks again for making such an amazing plugin. Been using this for a while now on and off – but the computing power required is really much. I was wondering if it would be possible to create a CUDA or OpenCL versions that would offload the processing onto the GPU? I read you said Molot was not good for vocals. I have to dis agree here. I mixed a song recently and for lead vox, I was sure I’d need some pre fx volume automation in order to make it possible for any compressor to do it”s job. Then I pulled Molot out. In 30 seconds I had it knocking off up to 10 or even more db with literary no artifacts (just adding its color that I love so much). So, I’ve been using Molot on everything (I couple of times I used it on 2 buss, too) for more then a year know and it’s still one of my favorite comps free or commercial. Tnx a lot for the great plugin. HQ has linear phase oversampling with very steep stop-band to cut all possible aliasing artifacts. Fast one has non-linear phase and very gentle stop-band so aliasing can pass through. I use Fast on tracks where a little dirt is allowed and “HQ” where pristine sound is desired. You open it with an archiver program like 7-Zip or WinRAR and then you copy the Molot.dll file into your VST folder so your main audio program can see it and load it. hey, long time molot user here…great stuff. the only thing i’m still not sure about: if you have render set to 8x, does it matter where the upsampling knob is turned? Never tried – I always render what I hear, but, it shouldn’t matter, actually I’m sure it doesn’t – that function is invented to save cpu cycles while mixing. I can’t use Molot on mono tracks in Logic X (using version 0.3.1). Any advice as to how to do this? I´m on a Win7 X86, and i´m using Pro Tools 10.3.0 but can not get this great find, to work or even be visable in my DAW. Any and all help sorely needed and much appreciated. Use VST to RTAS wrapper from FXPansion or Blue Cat Audio Patchwork to load VST plugins into Pro Tools. Thank you very much, but i might be over-worked or just slow; but the Blue Cat option did not work on my DAW. patience to explain this in layman’s term, step by step. If you have the time or patience to explain this in layman’s term, step by step. One of the best compressors available. Thank you! amazing compressor….it took but a minute to fall deeply in love with this thing. thank you vlad for your genius and generosity!!! Looks like a fantastic plug-in, I’m very interested in using it’s side-chain capabilities to speed up workflow in Premiere Pro. Unfortunately I am a Mac user and as of the latest manual it appears to me there is only a 32-bit version available for Mac, which prevents me from using the plugin on any Adobe CS product version ~ 5.0 and later. Will there be a 64-bit Mac version of the plug in on the horizon? Alternatively do you know of any other plug ins that support track on track side chain compression in Premiere CS6 and above? The documentation is pretty old (it’s for version 0.2.168). The latest version is 0.3.1 and it includes 64-bit Mac AU/VST versions. Fantastic, thank you for your quick response! Hi vlag, I’ve managed to get Molot working on Premiere CC, very excited. I’ve read through the (pretty old) documentation and I’m struggling to assign ‘Track A’ output as the side chain input for Molot in it’s R.S.Chain mode on ‘Track B’. Essentially I am trying to get a standard ‘ducking’ effect between the two audio tracks, am I going about this the correct way? Is there any direction you can give me here? Will Molot be ever released as AAX? Trying to open this with OS X Yosemite….No Luck. Will this function with Yosemite? hmm, I tryed to put on my old Cubase SX3 with my Vista and I do seem to have a problem with knowing witch “one” to put “where” !!! cause i dont find it in my plugins. I did follow the instructions. Amazing compressor, no matter what I do I can’t make it sound bad. Fells like using hardware, the sound reminds me of hardware DBX117 I sometimes use but much more versatile. Better than the overpriced hyped vintage desks emulations plugins in my book. I’d love to see EQ made by you as well, would be awesome. Yesterday molot just save my vocal bus, such a vibey glue. 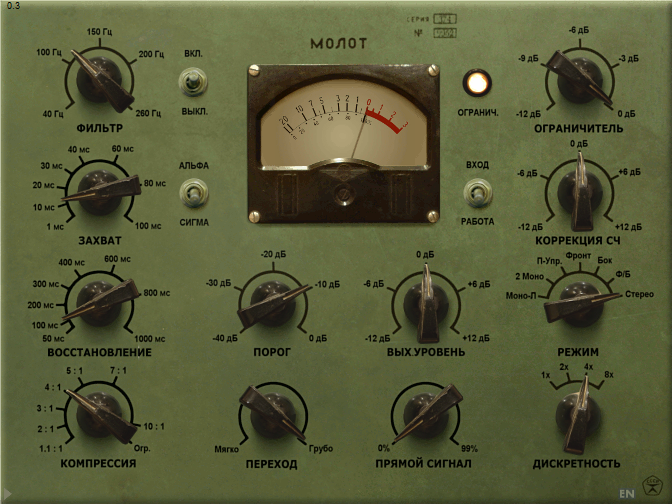 After all this years molot still rocks and is probably my favourite free compressor. Would it be to much hassle to add second release behaviour like you did with alpha/sigma mode with the attack? so that the release would be more opto/rms like? Like more vibey and pumpy and less “slapping. The attack is always spot on, I can set it in a minute but I can fiddle with the release for much longer time and sometimes it just doesnt feel right on some material.cheers! I know that Molot isn’t intended as to be a la2a comp, but comparing it with the currently free cakewalk ca2a, it almost gets the same sound, except the release of ca2a sounds like it has different curve to it than Molot, which creates a kind of pumping or sucking effect. If Molot had the option for that sort of release behavior it would be even more versatile than it already is. It’s really interesting because I never intended for Molot to sound as LA2A. Also I have hardware LA2A clone and yes, LA2A has some feel of “automated” release but Molot has feel of “laziness” in its release behavior. I’ll try to think about it, but on the first thought it’s because LA2A is feedback compressor. This pluggy is the clear choice for drums, it does a beautiful job of working acoustic drum with electronic music. That has been the most difficult trick, getting those drums to sound “live”. Getting those cans to sound real in any genre is the bread and butter. Thanks! I have UAD too and I like and use their 1176 and LA2A a lot. Molot is just another tool in toolbox and as another tools it’s used when it’s needed. For example several days ago I used Molot+LA2A on a vocal and for that specific type of vocal it worked better than classic 1176+LA2A pair but it doesn’t mean Molot is better than 1176. It’s just another tool but with quality good enough to be used as pro tool. Just stopping by to say thanks. This is a kickass compressor plugin. I’m about to update to Mac OS 10.12 but I’m hesitating because of this compressor. Can anyone confirm that Molot works without issues?? Really great work by the way! I’m going for it! I’ll let you know how it pans out. Fingers crossed. well, what can I say….. AMAZING COMP! I can sell some of my paid compressor without regrets now. Molot can do everything I need. The only suggestion would be a “look-ahead” feature. Any chance your awesome plugins would be available for linux? 2017 and I’ve only just come across this gem. This thing is exceedingly flexible. Now I’m finally starting to hear the effects of compression, after maybe a decade or two, that is really an awesome thing to have. (On that note: I can recommend Ken Lewis’ video on classic compressors, their attack and release characteristics, to anyone.) Thanks Vladg! Hi Vlad. I’m a dark ambient composer whose just trying to teach myself how to mix and master. I was looking for a BUS compressor that had some interesting character. I used the MOLOT on the MIX buss on every track on my project Black Box Memories – Transmissions. I used it just to colour, with a max of about 2db of attenuation. I think your compressor is awesome. Spasibo i molodec, Vladimir! This ist THE compressor Plug In i was searching for all this time! I will put in shortly some examples of how I use it as a Single Channel, Buss or Master Compressor. Alongside with the Slinky EQ and the Limiter6, the Hammer is unbeatable! Bolshoy Spasibo! As I promised, this song by the great band “Robert Jon And The Wreck” is mixed entirely in the box and it bears the “Molot” Compressor as a Buss and Master compressor. It works smooth, allthough very musical and it can also sqash the s**t out of the material, if wanted. I used it on the vocals buss, the instrumental sum and the master buss.